Heat oven to 350°F. Spray 5- or 6-cup fluted tube cake pan or 8 1/2x4 1/2x2 1/2-inch loaf pan with cooking spray. In small bowl, stir together flour, baking powder, 3/4 teaspoon salt, the cinnamon and nutmeg. Set aside. In medium bowl, beat granulated sugar, yogurt, oil, grated orange peel, vanilla and seeds scraped from 1/2 vanilla bean with whisk until well blended. Add dry ingredients to wet ingredients; stir just until combined. Pour batter into pan. Bake 45 to 50 minutes or until toothpick inserted near center comes out clean. Cool in pan on cooling rack 15 minutes. Remove cake from pan to cooling rack. Cool completely, about 1 hour. In another medium bowl, beat powdered sugar, 1/8 teaspoon salt, the orange juice and seeds scraped from 1/2 vanilla bean with whisk until smooth. 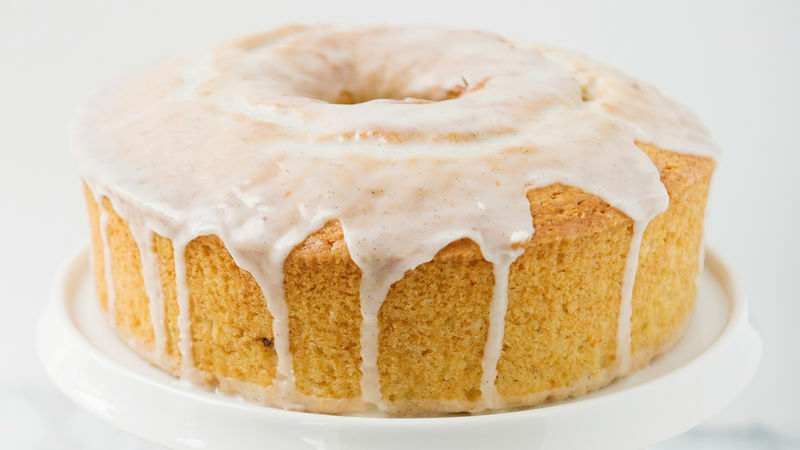 Pour glaze over cake. Let stand about 30 minutes or until glaze is set before slicing. If the glaze is too thick, add a little more orange juice. If too thin, add more powdered sugar to thicken it. Grated lemon peel and lemon juice would be a great substitute for the orange.